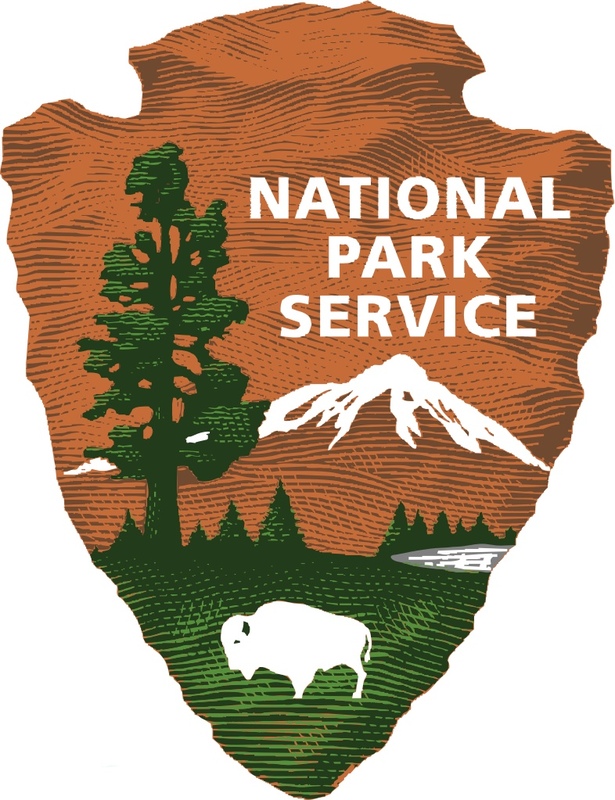 Over four-hundred parks, preserves, forests, seashores, rivers, monuments, memorials and historic sites make up the National Park System. During my recent tour of the Southwest, I was fortunate to visit fifteen of them. Seven of the biggest are in Alaska, including the largest park, Wrangell-St. Elias. At 12,500 square miles, it’s bigger than each of the nine smallest states. Death Valley is the largest in the lower forty-eight states. The smallest park is Hot Springs in Arkansas at around nine square miles. The popular ones–Death Valley, Joshua Tree, Carlsbad–certainly live up to expectations, but I took more pleasure discovering the remote, less visited sites. 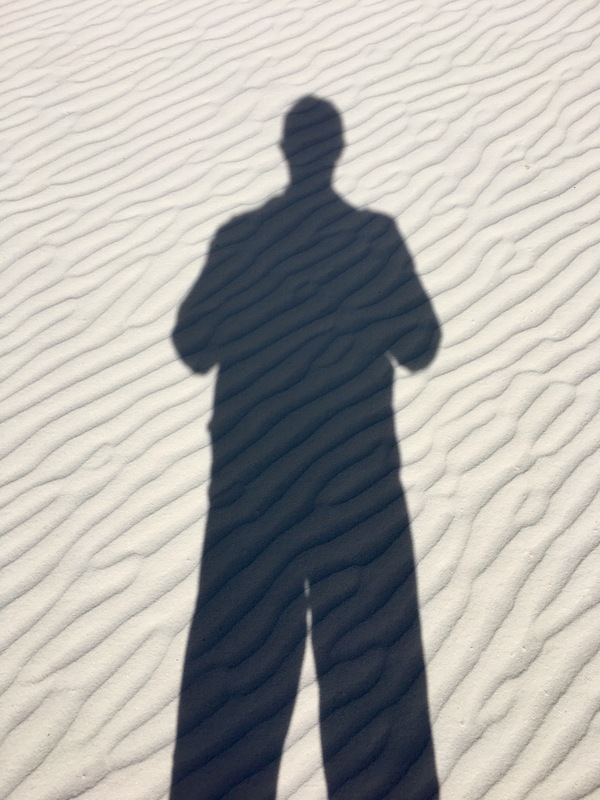 On this leg of my journey, I hiked through the “totem poles” of Chiricahua, the “decorated” chambers of Carlsbad and the snow-white drifts of White Sands. Perhaps most memorable of all was the afternoon I spent scrambling alone among the ancient petroglyph-rich rocks of Three Rivers. 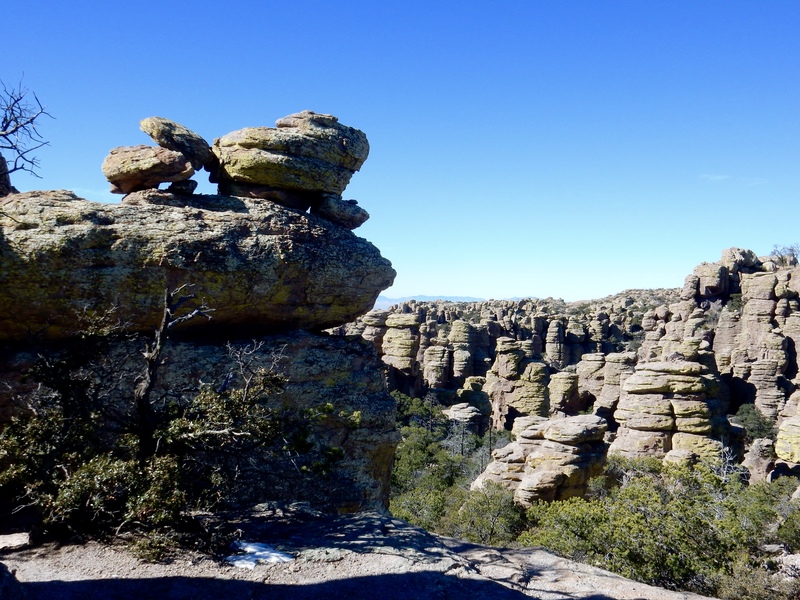 Chiricahua National Monument is located in southeastern Arizona, about an hour from the interstate. Quiet country and empty roads. The yellow grassland, where a few cattle graze, is interrupted by bare mountain ranges. I spotted two deer and a roadrunner as I pulled into the entrance. 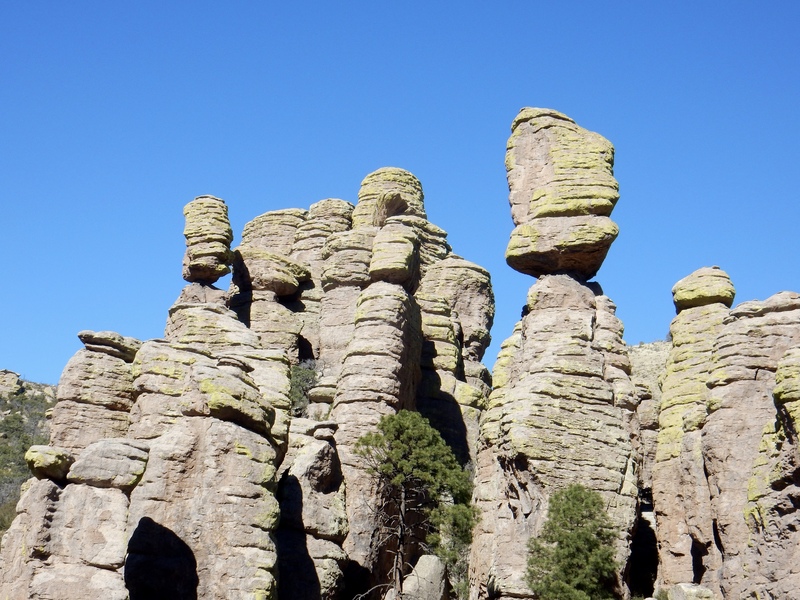 The park is within the Chiricahua Mountains, which rise from the valley floor to nearly ten-thousand feet. The range is considered a sky island, a mountain isle in a desert sea. 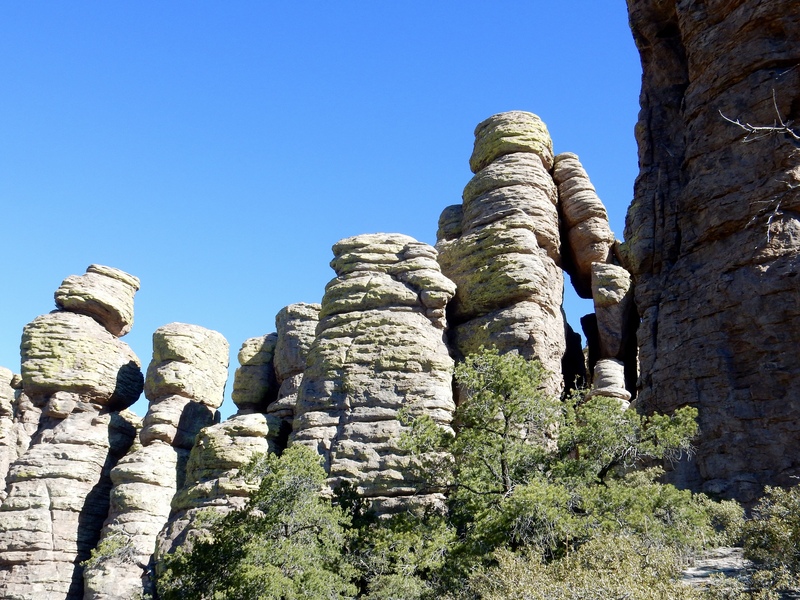 At Chiricahua, ecosystems are stacked vertically on top of each other with grasses at the bottom, then cactus, then hardwoods, then evergreens at the top. I passed through them one by one on the uphill drive through Bonita Canyon. The park claims to be populated with the usual suspects: mountain lions, black bears, javelina and the elusive coatimundi. Coatis are related to raccoons but, in photos at the visitor center, look more like brown, long-tailed opossums. I didn’t see any. In the 1800s, Chiricahua’s maze of rocks served as an impenetrable fortress for Apache warriors, led by Cochise and Geronimo. One of Geronimo’s lieutenants, “Bigfoot” Massai, escaped the US Army and hid in the mountains for more than twenty years. He was never caught. Starting at snow-covered Massai Point, I hiked a trail down into the pinnacles, between and around them. They line the valleys and climb the canyons, many coated in chartreuse-colored lichen. Due to their shapes, they are sometimes described as totem poles or giant chess pieces. Some have collapsed and lean drunkenly against their neighbors for support. Rocks the size of boxcars balanced precariously over my head. Between Willcox, Arizona, and El Paso, Texas, I passed through cattle country. I can’t imagine what the cows find to graze on in the desert. I passed huge fenced pistachio orchards, countless rows of trees spaced carefully on bare ground. At 4,585 feet, I crossed the Continental Divide. To the east of El Paso are miles of junkyards, body shops and “gentlemen’s” clubs. Eventually, the scenery improves. Unusual mountain formations erupt on the horizon. Hills sprawl, thick with yellow grass and soaptree yucca. 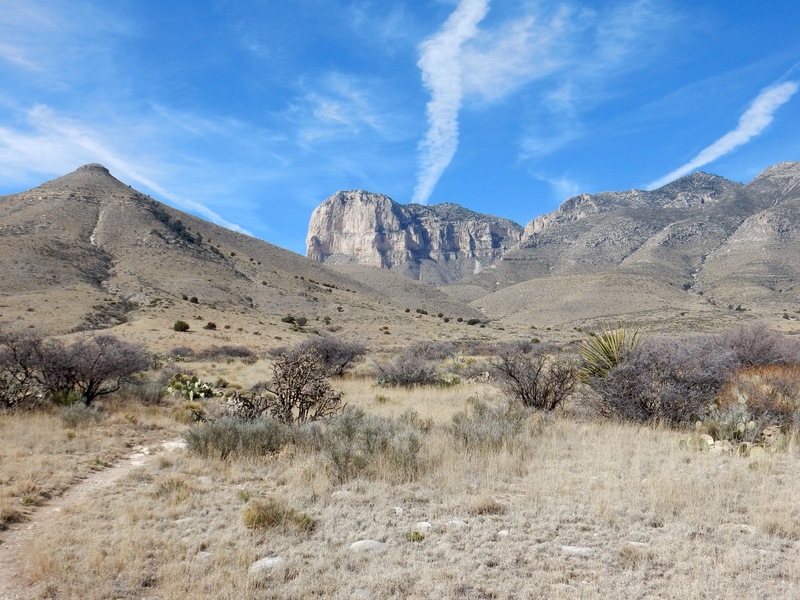 The park, a hiker’s paradise, contains a higher peak, Guadalupe, at nearly nine-thousand feet. Native Americans lived in the mountains twelve- to fourteen-thousand years ago and left behind arrowheads, baskets, pottery and rock art. In the 1500s the Spanish arrived. They introduced horses to the indigenous Mescalero Apache, who remained in the mountains through the mid-1800s. Within the park are the ruins of Pinery Station, a stop on the Butterfield Overland Mail Trail. Between 1857 and 1861, Butterfield provided a stagecoach service between St. Louis and San Francisco. The coaches stopped at Pinery for hot meals and fresh horses. 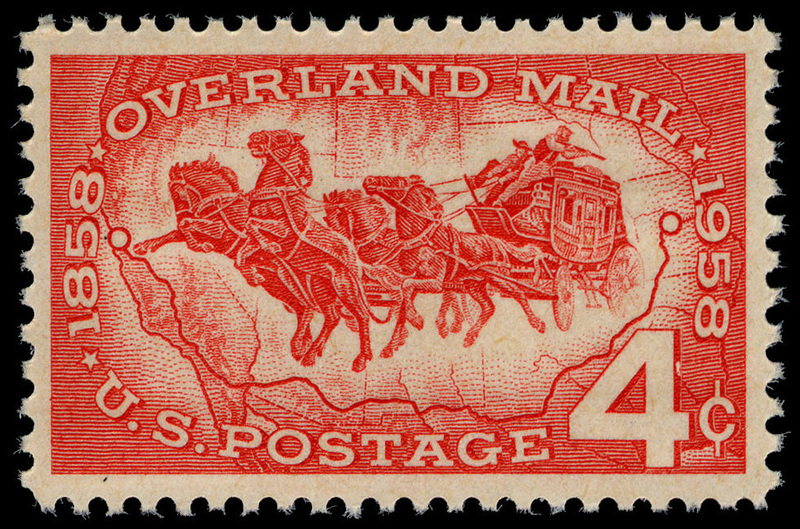 Butterfield was the first transcontinental mail delivery service in the United States. The coaches traveled day and night, averaging 120 miles per day. Each grueling twenty-seven-hundred-mile journey was completed in twenty-five days. The coaches were frequently attacked by Native Americans and robbers. A reporter for the New York Herald rode a Butterfield coach on its inaugural run. 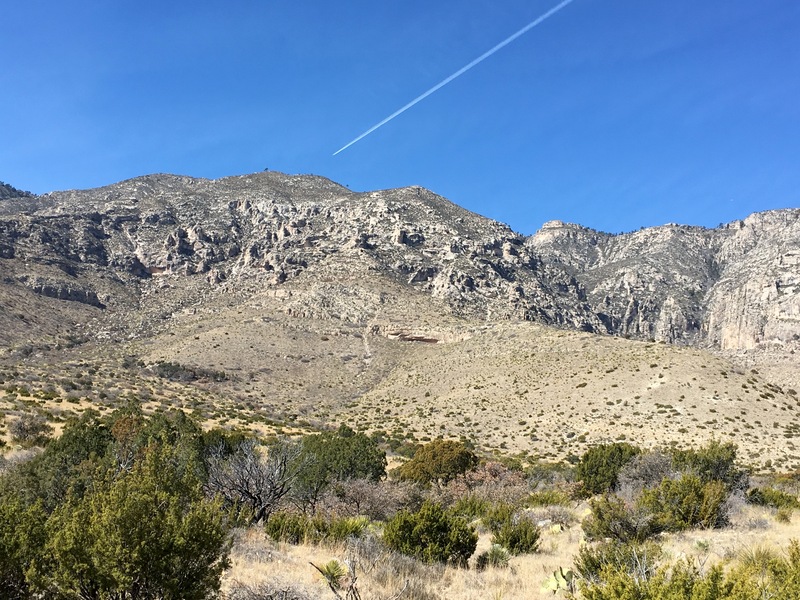 Next door to Guadalupe in the same mountain range is Carlsbad Caverns National Park. Early the next morning, a herd of deer grazed calmly in the shadows of a hillside, as I made my way into the park. I started my tour with a self-guided walk through the Natural Entrance, a huge gaping hole in the ground, like the mouth of a volcano. Several rows of theater seats wrap around the entrance to accommodate the viewing of bat flights. In the summer between 200- and 500,000 Brazilian free-tailed bats leave the cave each evening, swirling like a ribbon into the darkening sky. They move as one body toward the Pecos and Black river valleys, where they feast on flying insects all night long. While in Carlsbad, I didn’t get to see the bats, as they were wintering in Mexico. Their portion of the cave is off-limits to visitors. Beyond the theater, a trail with twelve switchbacks descends from ground level down into the cave opening itself. The path generally follows the route used by early explorers, minus the repelling and rock scrambling. I left natural light behind. The trail surface inside is smooth with railings and guide lights, but very steep. The way ahead seemed an endless void. Dimly, I could see hundreds of feet down, as though I was edging my way around the inside of a bottomless well. As I descended, formations appeared at every turn, including Witch’s Finger, Whale’s Mouth and the Boneyard, a tunnel through what looks like a giant block of swiss cheese. Iceberg Rock is a 200,000-ton boulder that fell from the ceiling of the chamber. Nervously, I looked upward. In the early morning, I had the darkness, silence and eerie rock formations all to myself. The trail continues for 1-1/4 miles, down, down, down, switchback after switchback for over seven-hundred feet. At the bottom, incongruously, is a snack bar, a souvenir stand and an elevator back up to the visitor center. The elevator indicates vertical feet, not floors. At the top, it reads 0; at the bottom, -750. I bought a cup of piñon-nut coffee at the café. Certificates are available for those wishing to prove they ate an energy bar seventy-five stories below the surface. “An interesting place to work?” I asked the server. “Yeah, when the elevator isn’t broken,” she said. I was more impressed that the underground toilets worked. An engineering feat. The caverns have been an attraction for centuries. Native Americans left drawings on the walls near the cave’s entrance, although they probably didn’t venture far inside. Early settlers found the entrance via the nightly bat flights. They stayed to mine bat guano and sell it as fertilizer. Jim White, a local boy, first visited the deeper recesses of the cave in 1898 and explored it many times with the use of a homemade wire ladder. Imagine a 16-year-old crawling around inside of an upside-down skyscraper, seventy-five stories deep, with nothing to illuminate the darkness but candles. For years, White had difficulty convincing people of the size and splendor of the cave until the first photographs of the interior became available in 1915. His names for many of the cave’s chambers and formations are still used today. Carlsbad was eventually declared a national park in 1923 and a World Heritage Site in 1995. In case you are wondering, as I was, an individual cavity is called a chamber. An especially big chamber is called a cavern. And an entire system of chambers, caverns and connecting passages is a cave. So, Carlsbad Caverns (plural) is a cave (singular). 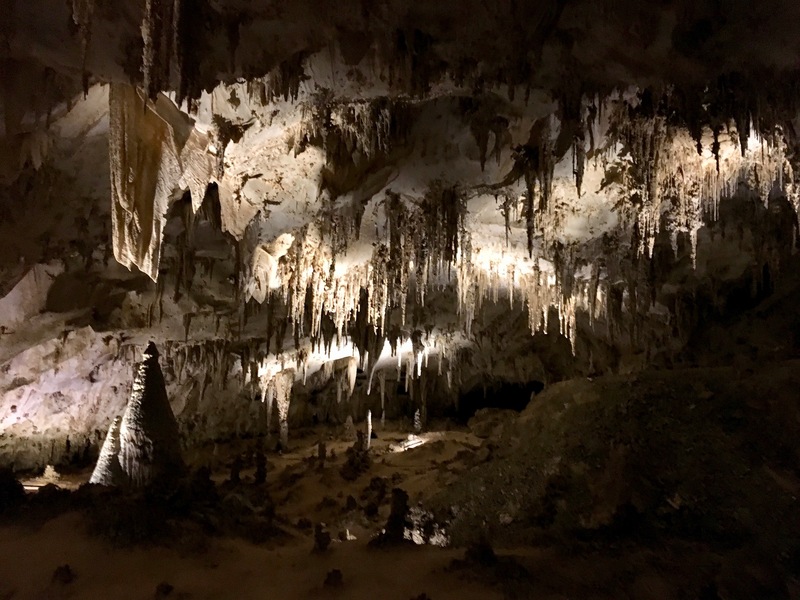 One of Carlsbad’s caverns, the Big Room, is almost four-thousand feet long and over six-hundred feet wide, roughly the size of six football fields. Its ceiling is over twenty-five stories high. It is the fifth largest cave chamber in North America. 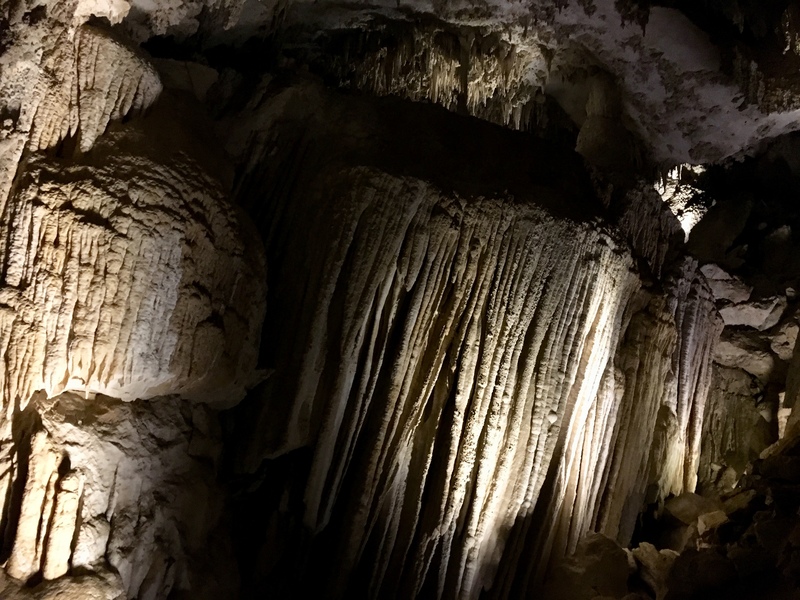 Carlsbad developed a few million years ago, when natural acids dissolved limestone deposits and formed holes in the rock. 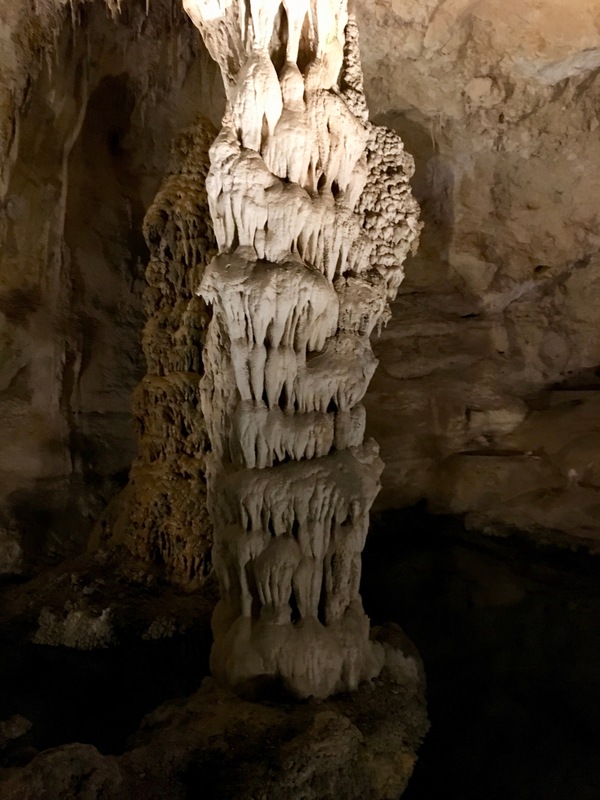 The exotic formations within, the stalactites and stalagmites, soda straws and columns, draperies and popcorn, have been created by dripping water over hundreds of thousands of years. The park contains over 119 chambers, thirty miles’ worth, only a few of which are open to the public. In 1986 another cave, Lechuguilla, was discovered with over 120 miles of passages. 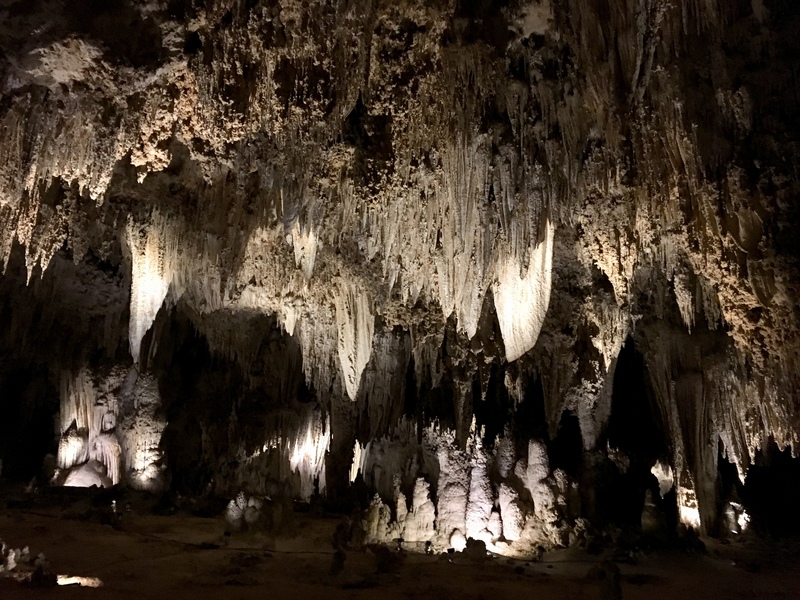 Some are at a depth of sixteen-hundred feet, making Lechuguilla the second deepest limestone cave in the United States. Due to its pristine condition and delicate formations, the cave is closed except to scientists. I joined the guided King’s Palace tour. Our group descended to eighty-three stories below the surface and entered a gated section of the cave. Along the route, the ranger pointed out smudge marks and scratchings left on the walls by explorers in the early 1900s. The tour slowly passed through three highly decorated chambers, King’s Palace, Queen’s Chamber and Papoose Room. The ranger asked for suggestions as to how best to characterize the elaborate rock formations. Lace, was offered, as was spanish moss and melted candle wax. The best, I thought, was gothic cathedral. After a quick break, I joined the Left-Hand Tunnel tour. 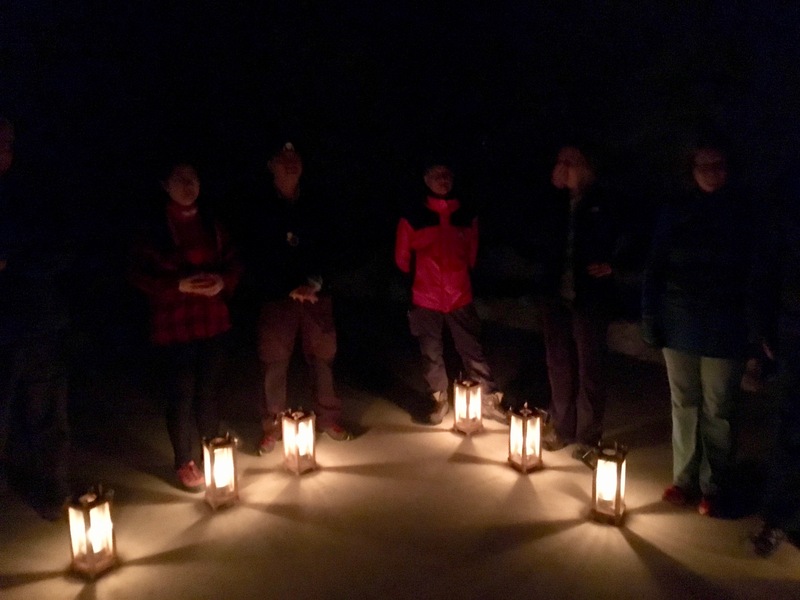 This hike follows the route of the 1923 US Geological Survey team and, with a nod to tradition, only candles are used for light. A smaller group this time, just twelve. Our guide, Mark, is an avid caver and geologist. 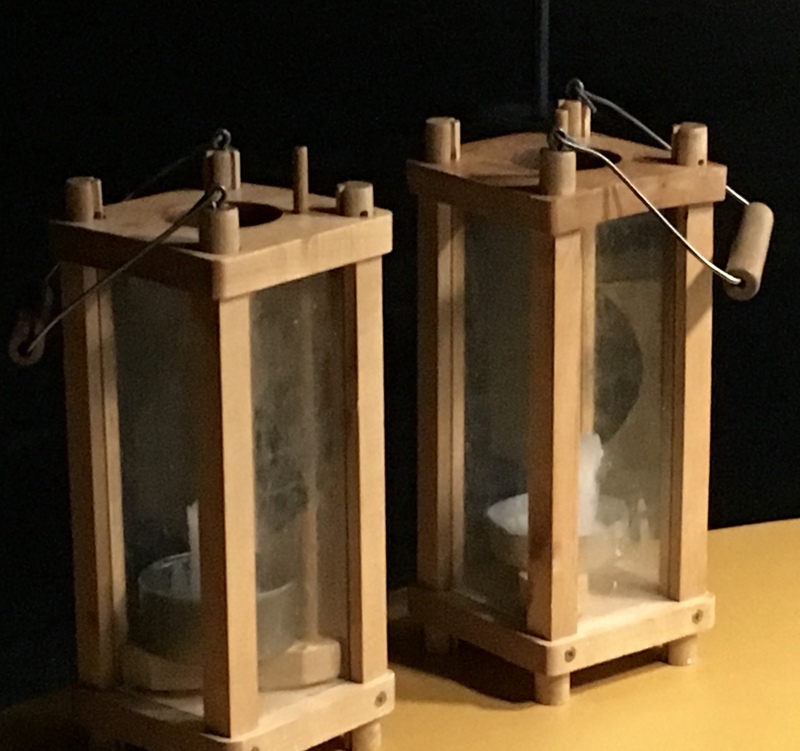 During the orientation session, he distributed a candle lantern to each of us. At the entrance to the passage, Mark unlocked a large metal gate. We lit our lanterns and entered, and Mark locked the gate behind us. No electric lighting, no paved trails. The path was rocky and rough, like hiking in the woods at night. In places, we climbed steep slopes and stepped around pools of water. We found fossils embedded in the walls, left over from when the mountains were undersea, some 250 million years ago. Along the way, Mark gave detailed geology and chemistry lessons. We crossed bridges above deep fissures and collectively shined our lanterns downward. Explorers used to toss stones into one of the holes called the Bottomless Pit in order to determine its depth. No sound was ever heard. Later exploration revealed its depth to be about fourteen stories. The stones made no sound because the pit’s bottom is covered with soft dirt. Further on, we found bat guano and some ancient carcasses, which Mark claimed were perhaps ten-thousand years old, preserved by the cave’s microclimate. We proceeded until a pool of water blocked our way. Real cavers would have waded through, but we are tourists and so we turned back. On the way out, Mark conducted a blackout session so we could experience the absence of light and sound. We sat in a circle in the dirt, our lanterns in front of us on the ground. One by one, in month-of-birth order, we blew out the candles. Mine was last. For a moment we pondered the practical nature of his question. Between Carlsbad and Alamogordo is the Sacramento Range. The snow-capped Sierra Blanca at 11,981 feet peeked over the yellow grass of the high desert as I approached it. Except for a few pickup trucks, I was alone on the road. I stopped at a farmer’s market, Runyon Ranches, and was surprised to find a zebra, a camel and a water buffalo. The owner said the animals had been rescued. They are now the stars of his petting zoo. The Sacramento Range includes parts of Lincoln National Forest (the birthplace of Smokey the Bear) and the Mescalero Apache Reservation. Hotels and chalets crowd the slopes of the popular ski resort town of Cloudcroft. 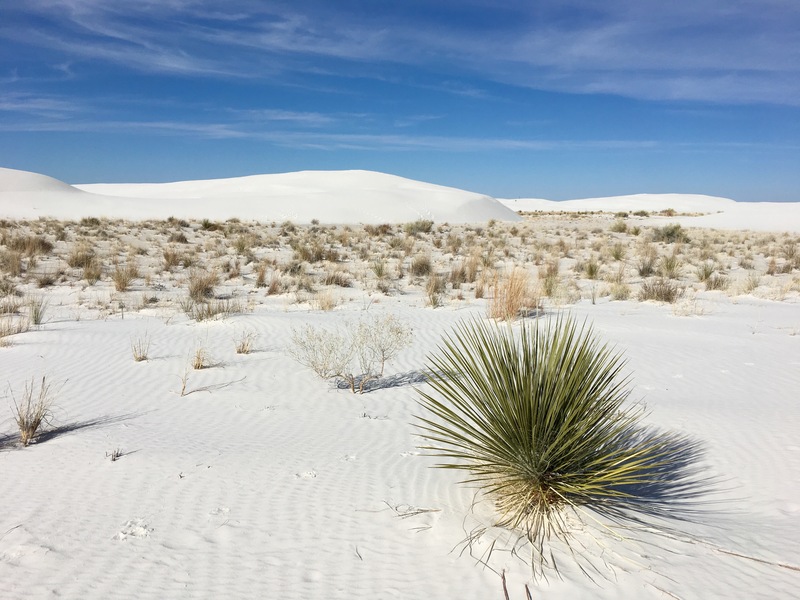 As I descended from the mountains, Alamogordo huddled on the valley floor with the expansive white sands of the Tularosa Basin behind it. The basin is bigger than Connecticut. 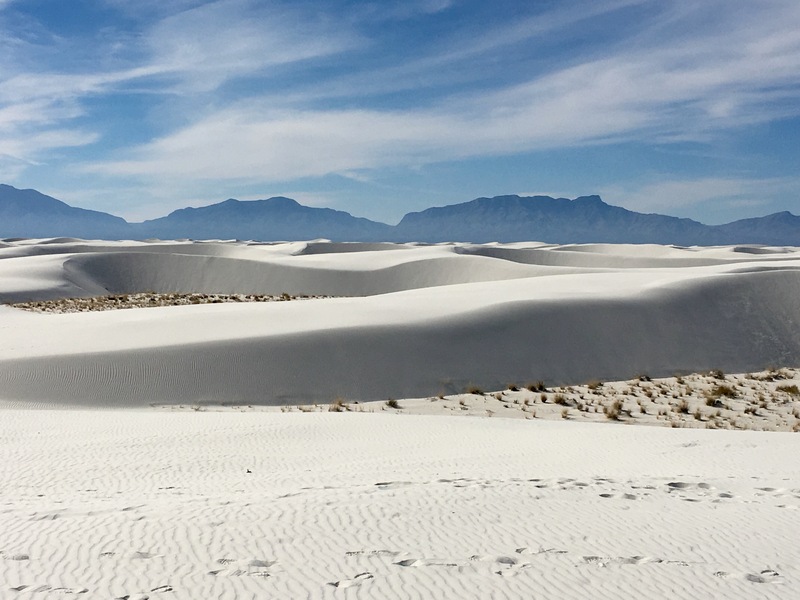 Within the valley is White Sands National Monument, Holloman Air Force Base and White Sands Missile Range. The monument and a section of US 70 are closed during missile tests, which happens a couple of times per week. At the north end of the basin is the Trinity Site, where the world’s first atomic bomb was detonated on July 16, 1945. The sixteen-mile drive through the monument weaves between shifting mountains of sand. Once inside the dune field, all is white except for the sky. Sand drifts across the road. Much of the drive is on hard-packed sand, which must be cleared daily with heavy equipment. The consistency of the sand is fine and powdery, like flour. The park looks perpetually like a snowy winter day in Ohio. Barefoot kids in swimsuits run up and down the hills dragging plastic sleds. Parents watch them from beach chairs while munching picnic lunches. Campers lug their gear deep into the dunes, looking for their assigned sites. 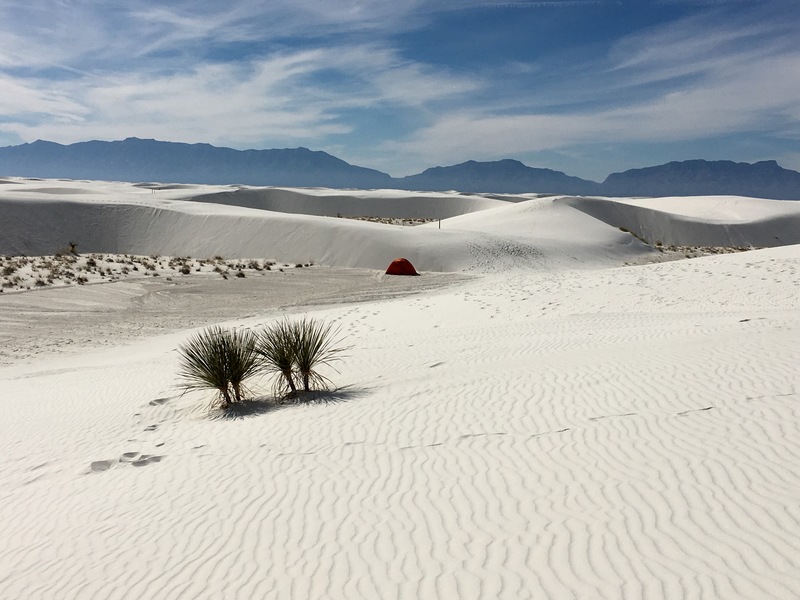 White Sands is a 175-square-mile beach in search of an ocean. 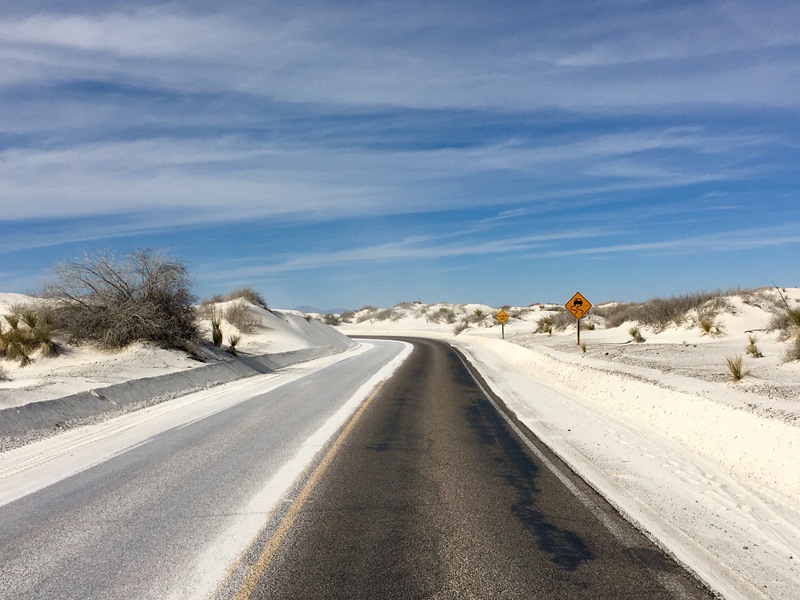 The dunes are composed of gypsum crystals, unusual because gypsum is water-soluble. But, because the Tularosa Basin is enclosed, dissolved gypsum has nowhere to go. It continually recrystallizes as sand. The dunes move and settle with the wind. Desert animals, such as lizards and mice, have evolved for their own protection, turning white in color. Human beings have adapted too. Incredibly, people have lived in the Tularosa Basin for over eleven-thousand years. In 1849 the US Army found the Mescalero Apache living in the area. I hiked a loop-trail through the dunes, following markers so as not to get lost. Once away from the sledders, the world was silent. The white sand dazzled in the sun, whiting-out my vision. The trail led over steep dunes and through loose sand. Behind me, the wind erased my footprints. I left Alamogordo and headed north for Santa Fe through pistachio groves and vineyards. Tumbleweeds rolled across the highway. To the east, snow dusted the Sacramento Mountains. To the west, white clouds of sand swirled over the Tularosa Basin. I passed by Lincoln County–Billy-the-Kid country. In the late 1870s, a conflict arose between business competitors in Lincoln over the control of cattle and dry goods. The two factions, led by prominent businessmen, formed unholy alliances with both lawmen and criminals. One gang, called the Regulators, included one Henry McCarty, a.k.a. William H. Bonney and Billy the Kid. As I learned in Tombstone, Arizona, the players in these Wild-West disputes usually knew each other well. Marshal Virgil Earp played poker all night with Tom McLaury before killing him the next day near the O.K. Corral. Sheriff Pat Garrett, who hunted down Billy the Kid, once joined him in stealing horses. Distinguishing the good guys from the bad is not black and white. During the Lincoln County War, back-and-forth revenge killings climaxed in a five-day shootout. The Kid was pursued for his part in the murders. The story has been fictionalized in several movies, including Chisum in 1970 and Young Guns in 1988. Multiple times, the Kid was captured, only to escape. Garrett finally caught and killed him, although some believe he helped the Kid fake his death and allowed him to escape. 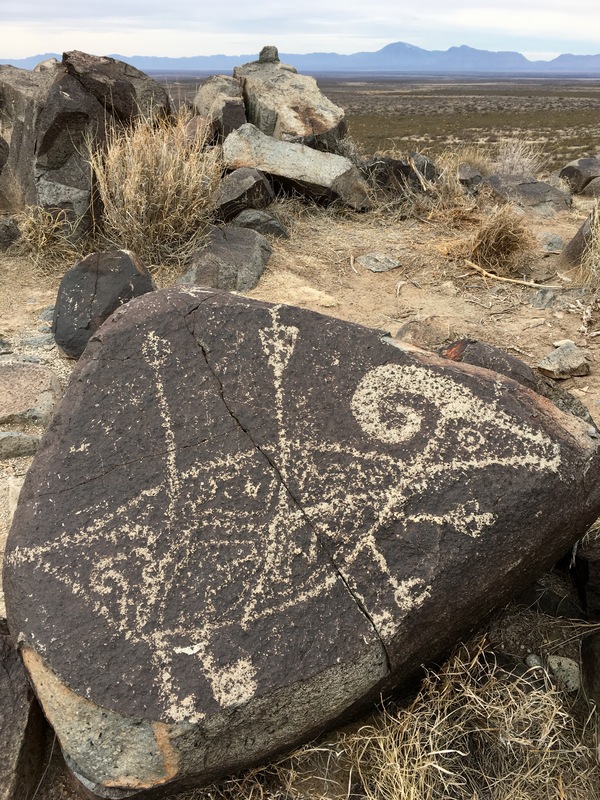 On a whim, I stopped at Three Rivers Petroglyph Site. The park is protected by the Bureau of Land Management, not the National Park Service. Accordingly I wasn’t expecting much but found, instead, a treasure trove of ancient rock art. There’s not much to the park’s facilities–a tiny office and some detached restrooms. A half-mile trail winds up from the parking lot to a volcanic ridge and a boulder field of rocks. And there along the rocky trail are the petroglyphs, thousands of them, all within reach. An outdoor art gallery with no protective railings. I was amazed at the accessibility. 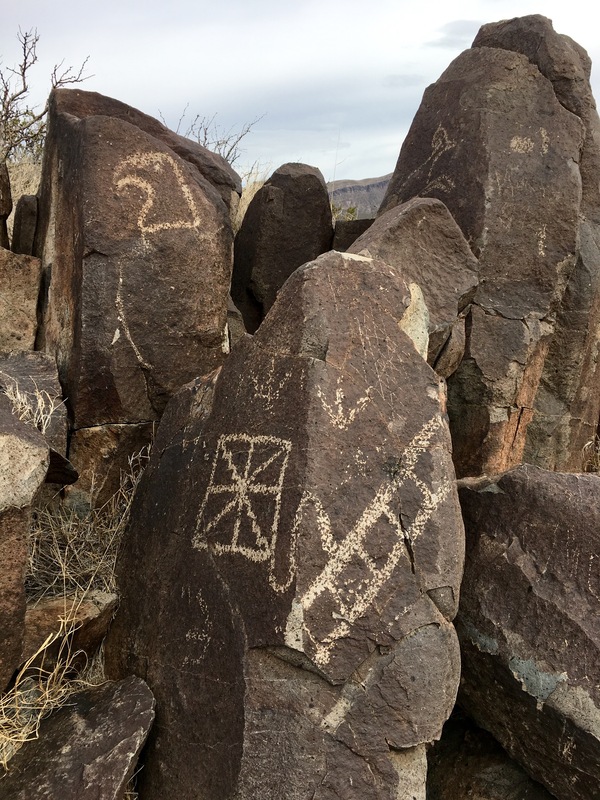 The petroglyphs were created between 900 and 1400 CE by the Jornada Mogollon culture. Walking among them, I worked at identifying the subjects–human beings, animals, animal tracks and plants. And what is the meaning of the geometric shapes? Are they spiritual in nature or the doodles of bored hunters? Did the rock carvers anticipate someone like me, centuries later, would examine their work for meaning? The sheer number of images makes Three Rivers one of the largest and richest petroglyph sites in the Southwest. For one afternoon, I was alone in the museum. Don’t leave us hanging…how do bats poop upside down??? According to Mark, bats hang upside down so they can spread their wings to fly before casting off from the cave’s ceiling. When a bat relieves itself, it releases one of its feet from the ceiling, swings its body sideways, hangs from one foot, sees a man about a horse, then swings back up and reattaches, Cirque du Soleil-style. Who knew bats were so clever?